A New York City octet, one of three funk and/or disco bands in which producer/keyboardist Randy Muller was involved. The original lineup featured Denise, Delores, and Bonny Dunning as vocalists, with guitarists Solomon Roberts and Anibal Anthony Sierra, keyboardist Larry Greenberg, bassist Gerald Lebon, and drummer Tommy McConnell. Muller organized the group and they recorded for Salsoul from the late ’70s until 1984. Their biggest hit was “Call Me” in 1981, an R&B chart-topper. 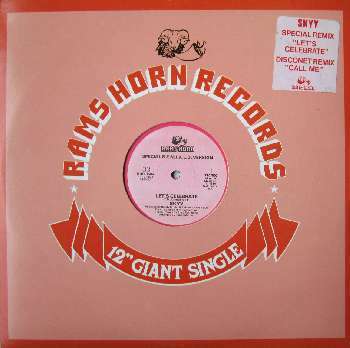 In 1986, Rams Horn Records released this fantastic 12″ with two Skyy hits remixed by Shep Pettibone.